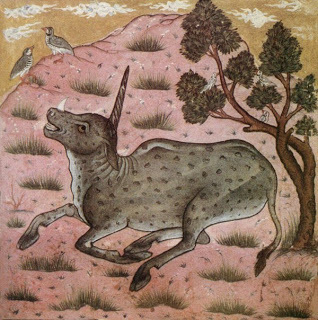 Although the translation of the word Karkadann is “Lord of the Desert”, the word is often used as a synonym for the Persian unicorn. Although the myth of the Karkadann has some similarity to Western unicorn lore, such as the beast’s ability to be tamed by virgins, this mythical animal has far darker and more sinister legends surrounding it than the typical images associated with the Western unicorn. Instead of a beautiful horse with a spiral horn arising from its forehead, the Karkadann is a ferocious monster able to be slain only by the greatest heroes of ancient Persian lore. 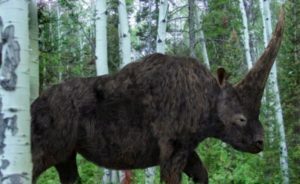 It’s thought that the origins of the Karkadann legend might come from exaggerated versions of real-life encounters with the Indian rhinoceros, or even ancestral memories of an extinct animal known as the Elasmotherium. 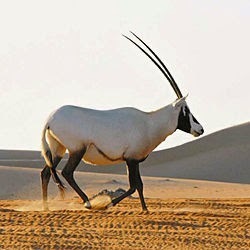 Then there’s the theory that the myth of the Karkadann arose from a view of the Arabian oryx, a two-horned antelope, from the side. The magical powers of the Karkadann horn, both as a source of poison and an antidote to it, made it a rare and valuable object. 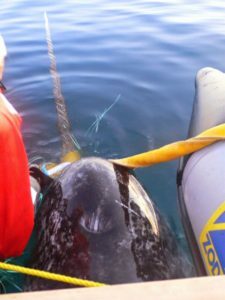 Often the Karkadann horn was described as curved, like a saber, rather than the spiral horn of the Western unicorn, based possibly on collected remains of the narwal. In addition to their fondness for female virgins, the Karkadann could be soothed by the cooing of turtledoves. Otherwise, they had ferocious temperaments, and often fought with elephants, their mortal enemies. In these fights, the Karkadann would impale the elephant’s soft underbelly, only to be blinded by the melting fat of the elephant and die along with it. For a far more academic account of the fabled Karkadann and related fabulous creatures, check out The Unicorn: Studies in Muslim Iconography by Richard Ettinghausen.